With spring in the air, it's time to start thinking of long nights on the patio with food friends, and a bit of vino. 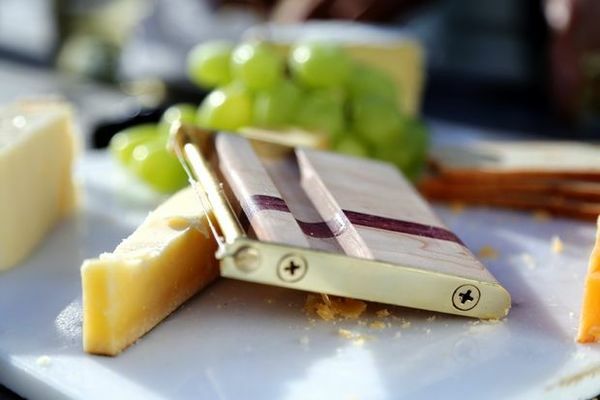 Nothing goes better with that bottle of wine than the cheese plate, and here's a handcrafted cutter that looks as good as it works. It's not everyday you see something ordinary revisited so well. The Oree Wooden Keyboard is a piece of excellence that immediately inspires the maker in me. This custom wood keyboard and touchpad are incredible. Even though summer is gone, you will continue to host awesome dinner parties and you'll definitely need to make some of these cutting boards. If you're asking, "what would I do with a handmade wooden neck- or bowtie?" we have thirty-five simple words for you. "Oh my gosh, what wouldn't you do with handmade wooden neck- or bowtie?! What are you? Do you also hate Christmas and world peace? Take your terrible attitude back to your crummy totalitarianism, you drivelspot." Okay, we'll grant it's a legitimate concern. So, I guess a better answer is: you design it, cut and shape it from soft wood, put a string through it, then post it on Instructables.